When I choose a treat to test drive from Chewy.com's monthly sampling, I always try to select a high-value snack that will be useful for a range of training applications. This month, I may have gone a bit too far in the high-value department. The freeze-dried, single-ingredient treats seem to go over really well. And why not? It's not like wild dogs, dingoes, wolves, coyotes, and other canids are going to mix up treats made of meat by-products, bone meal, mono-and diglycerides, and high-fructose corn syrup when left to their own devices. 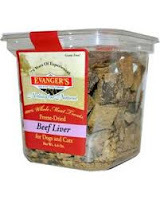 So I ordered Evanger's Nothing but Natural Beef Liver Freeze-Dried Treats, and thought about what activities we could do to test whether my dogs really loved these snacks. I predicted they would, as they really look as advertised--nothing but perfectly training-treat-sized morsels of freeze-dried beef liver. Should we do some agility and pilates tricks? Or maybe try some reactive dog training? As it turned out, my dogs saved me some trouble. I came home one day to this scene. I guess they were pretty good! I'm kind of bummed I didn't get the chance to watch them enjoy these delicious snacks, but I'm glad they got to enjoy them in my absence. Thanks Chewy.com! Evanger's is one of my favorite brands, so am very glad your dogs were happy with the high power treats! LOL. I now order my Wysong kibble and burgers through Chewy.com. I once had two bags sliced opened in the box, so kibble was spilled throughout the box. I live chatted with Chewy and bam! replacement bags were sent and better packed. I like their system but, for the amount of kibble I need every two weeks for 14 dogs, their packaging needs to be better. I look forward to trying these treats. Ha, ha - smart kids.